The “feathered dinosaurs” continue to make science headlines. While there is nothing in the historical creation model that is at odds with some dinosaurs having feathers, the hype that has been generated around this leaves even some evolutionists like Storrs L. Olson, Curator of Birds at the Smithsonian Institution disgusted by the unwarranted speculation. In 1999, National Geographic was forced to admit that their much-touted Archaeoraptor fossil was a fraud. Independent studies by embryonic researchers and respiratory experts reported in the journal Science that dinosaurs evolving to birds is just not a reasonable scenario (Creation Ex Nihilo 20:41, 1998). Archaeopteryx is considered by many evolutionists to be an ancestral form linking reptiles and birds. While Archy certainly is a unique creature, its fully-formed feathers, wish bone, and perching feet clearly establish that it was a bird. Evolutionists point to it having a tail and claws on its wing. But some birds that are alive today exhibit these features. It is best described as a mosaic creature (like a platypus) that has some special features, like teeth. 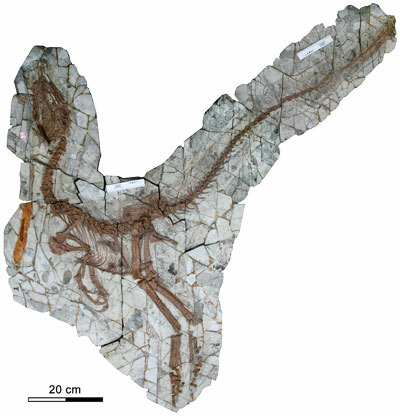 Some Darwinists have even suggested that the small carnivorous dinosaur Compsognathus could be the transitional dinosaur between Archy and the reptiles. 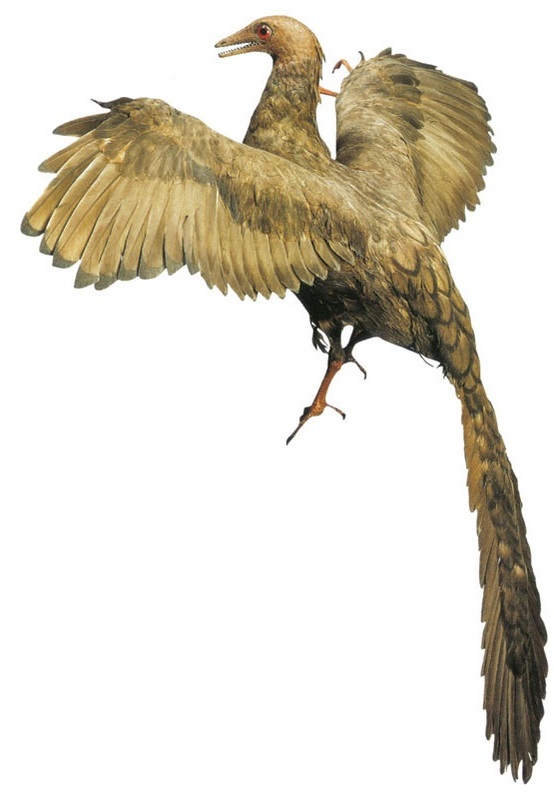 Although the Compy appeared to have hollow bones, it makes a poor specimen for the evolutionists speculation because it co-existed with Archaeopteryx. Other evolutionists point to the elongated hands of the dinosaur Deinonychus and claim that it may have been the predecessor to Archy. But it is thought to have lived millions of years after Archaeopteryx! Moreover, dinosaurs are divided into two formal groups: lizard-hips and bird-hips. Modern evolutionists have altered their story to claim that it is these lizard hipped dinosaurs that evolved into birds, which appears to be rather contradictory. In 2012 researchers published the story of an amazingly well-preserved Chinese fossil. (Xing, Bell, et al., “Abdominal Contents from Two Large Early Cretaceous Compsognathids (Dinosauria: Theropoda) Demonstate Feeding on Confuciusornithids and Dromaeosaurids,” PLoS ONE 7(8), 2012.) The clarity of the small theropod dinosaur Sinocalliopteryx gigas allowed the researchers to be able to make out its intact stomach contents! Three birds that were partially digested were so plainly visible that the researchers were even able to make out the species of the bird: Confuciusornis sanctus. The fact that dinosaurs were munching down fully-formed, beaked birds that were capable of powered flight indicates that they were very lithe and agile hunters. It also indicates that birds did not evolve as the descendants of these same dinosaurs! While this isn’t the first bird discovered in a dinosaur’s gut, it is the best preserved to date. Between 2004 and 2014 a number of papers by George Poinar were published, documenting his work with ancient Burmese amber. These extensive amber fossils were found near a coal deposit and are dated by evolutionists at 100 million years old. But the fossilized resins contain remains of modern-looking birds, reptiles, fish, clams, plants, and mammals in strata near or below dinosaur fossils. 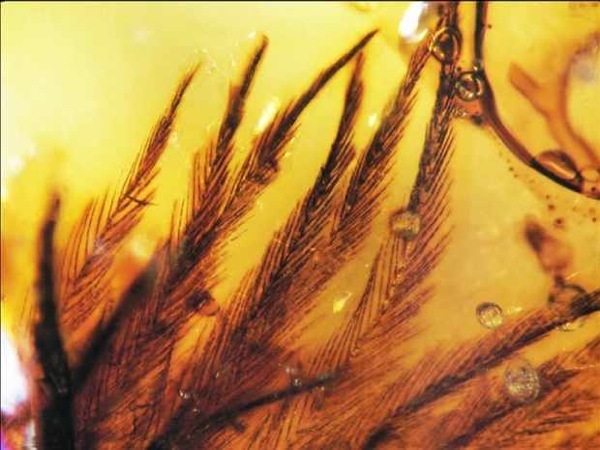 Among a spectacular array of modern insects, the amber preserved fully formed flight feathers, and even hairs! Most problematic of all for the dinosaur-to-bird story are the birds that have been found in rocks dated to the Triassic, a time in the fossil record that evolutionists believe preceded most dinosaurs. “Fossil remains claimed to be of two crow-sized birds 75 million years older than Archaeopteryx have been found….a paleontologist at Texas Tech University, who found the fossils, says they have advanced avian features. …tends to confirm what many paleontologists have long suspected, that Archaeopteryx is not on the direct line to modern birds.” (Nature, vol. 322, 1986, p. 677.) Dr. Alan Feduccia of the University of N.C. and the author of the encyclopedic The Origin and Evolution of Birds (1999) studied ostrich embryos and concluded: “Whatever the ancestor of birds was, it must have had five fingers, not the three-fingered hand of theropod dinosaurs.” (Naturwissenschaften 89:391-393, 2002) In a more recent work (Riddle of the Feathered Dragons, Yale University Press, 2012.) Fedducia provides a thorough analysis of the Mesozoic avian fossils from China, then exposes the massive, unfounded speculation that has accompanied these discoveries and been published in the pages of prestigious scientific journals. He argues that advocates of the current orthodoxy on bird origins have ignored contrary data, misinterpreted fossils, and used faulty reasoning. Famous geologist William Logan in the 1800s discovered what looked like fossilized bird tracks on Blue Beach at Horton Bluff in Nova Scotia, Canada. This rock layer containing the tracks is dated by evolutionists to the Carboniferous (300-360 mya). The Canadian Paleontologist Charles Sternberg, revisiting these tracks in 1933, said that they “superficially … resemble the tracks of some of the wading birds, but of course there is little probability of their having been made by birds.” (Sternberg, Charles M., “Carboniferous Tracks from Nova Scotia,” Geological Society of America Bulletin 44:951-964, 1933.) If these trace fossils were found in recent sediments, Sternberg would almost certainly have identified these as bird tracks. But probably the most fascinating site in this regard is from northwestern Argentina. There are fossilized bird tracks found in late Triassic sediments, when evolutionists believe that only the very earliest dinosaurs were supposed to exist (a supposed 55 million years before Archaeopteryx came along). (Melchor, R.N. et. 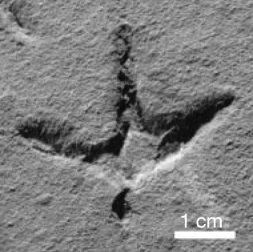 al, “Bird-like Fossil Footprints from the Late Triassic,” Nature 417, 2002, p. 936.) The tracks are so clearly birdlike and problematic that the authors have more recently attempted to re-date these sedimentary layers as a way of escaping the thorny issue. (Melchor, R.N., et. 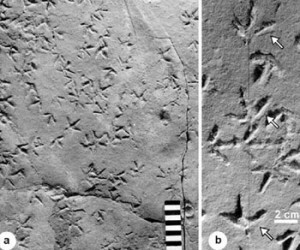 al., “A Late Eocene Date of Late Triassic Bird Tracks,” Nature 495:E1-E2, 2013.) The existence of numerous well-preserved bird remains directly alongside the oldest dinosaur tracks should effectively end the speculation that birds evolved from dinosaurs!